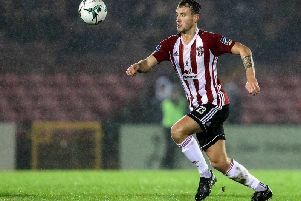 DERRY CITY: Hegarty not a done deal . . . YET! PAUL Hegarty may have opened negotiations with the Derry City Board of Directors in relation to taking over the managerial reins, but sources close to the Donegal man are not convinced the 48-years-old will take the job. Having successfully guided the “Candy Stripes” clear of the relegation area in his five games as caretaker, Hegarty’s relationship with the Brandywell club extends back over 30 years. And while he has assisted both Stephen Kenny and Declan Devine in the dugout before joining Peter Hutton in late July, the former midfielder has clearly made his mark during the latest sojourn. Always considered a “player’s player,” Hegarty has impressed both at Finn Harps and Institute and while he may not admit it publicly, the no-nonsense general would find it difficult to turn down the offer of managing a club he has always held close to his heart. That said, sources close to the player remain adamant that the Ballindrait man has yet to make up his mind, should the position be offered to him. One favourable factor, from Hegarty’s point of view, is that he holds the group of players his has taken over in high regard, having thoroughly enjoyed working with the squad over the past five matches. In fact, he believes that the current incumbents in residence at the Lone Moor Road venue boast so much potential that they could become a real force in the league and he continues to find it difficult accepting that such a group should have been battling against relegation. On the not so positive side, comes the news that just three players will remain in contract come the sounding of the final whistle at Longford Town next weekend - Aaron McEneff, Barry McNamee and Patrick McClean - so the new boss will have his work cut-out when attempting to plan for the 2016 campaign. And with that in mind, it has been confirmed that Hegarty and representatives from the Board of Directors have already met to discuss contractual issues. With chairman, Mr. Philip O’Doherty, currently in America on business, no-one at the Brandywell was prepared to answer the question posed last night, other than to confirm that negotiations had, indeed, taken place. Having publicly laughed off suggestions that other high profile personalities had made enquiries in relation to the position, Hegarty refused to make any comment after the recent Bohemians match, but he did admit that there wasn’t too much wrong with the group he has been managing. Despite difficulties from past experiences at the club, there’s absolutely no doubt that the Donegal man is keen to take control of affairs on the pitch. But, again according to sources close to him, situations must be put in place for that to happen. Given the contractual situation with so many players free agents after the final game, time is also an issue but as things stands, sources maintain a number of sensitive issues must be resolved before any appointment can be made.